Nebraska and Oklahoma say marijuana laws in neighboring Colorado are causing harm to their states and want the US Supreme Court to intervene. On Monday, court showed interest in the case by asking the Obama administration for a brief. What happens when your neighbor insists on having round-the-clock marijuana parties? Do you start having your own marijuana parties? Do you ignore your neighbor? Or do you complain to the police? That’s pretty much the position of two states – Oklahoma and Nebraska – who are fed up with their pot-smoking neighbor Colorado. The two states are asking the United States Supreme Court to take up their complaint that the legalization of marijuana in neighboring Colorado is causing irreparable harm in their own states, including significant interstate trafficking of marijuana grown, sold, and distributed legally in Colorado. Oklahoma and Nebraska want the high court to use its special jurisdiction to referee the dispute between the three sovereign states. Ultimately, they want the justices to declare that Colorado’s 2012 ballot initiative decriminalizing marijuana is preempted by federal drug laws and is, thus, unconstitutional. It is unclear whether the justices will agree to wade into the smoky controversy. But there appears to be some interest in the case by the court. On Monday, the justices asked the US solicitor general’s office to file a brief expressing its views on the issue. The Obama administration’s position will be important because, until now, the Justice Department has looked the other way while states like Colorado, Oregon, Washington, and Alaska have sought to decriminalize recreational use of marijuana. Despite these moves, marijuana continues to be listed as a Schedule 1 narcotic under the federal Controlled Substances Act, carrying the most severe restrictions. Oklahoma and Nebraska want the federal government to faithfully enforce the law. Some analysts see in the dispute the same broad concept of “prosecutorial discretion” cited by President Obama in his controversial executive action offering special immigration status to more than 5 million migrants who entered the US illegally or overstayed their visas. That effort was halted by a federal judge’s injunction and is pending before a federal appeals court. In a similar use of prosecutorial discretion, former Attorney General Eric Holder and his Justice Department colleagues have instructed prosecutors to focus their limited resources on other – more serious – crimes. Oklahoma and Nebraska insist they need help. “In passing and enforcing Amendment 64, the state of Colorado has created a dangerous gap in the federal drug control system enacted by the Unites States Congress,” Nebraska Assistant Attorney General Ryan Post wrote in his motion to the high court on behalf of both states. “Marijuana flows from this gap into neighboring states, undermining Plaintiff States’ own marijuana bans, draining their treasuries, and placing stress on their criminal justice systems,” the motion says. In defending its decriminalization, Colorado says its legal regime is designed to channel demand away from a multibillion dollar black market and into a licensed and closely monitored retail system. The state also stands to reap substantial tax revenues. “No one contends that Colorado law trumps the federal marijuana ban or immunizes anyone from federal prosecution,” Colorado Solicitor General Frederick Yarger wrote in his brief. “Instead, the question here is whether a state that chooses to legalize marijuana is then prohibited from regulating the market for it,” he said. Colorado says that since the CSA was enacted more than 40 years ago, virtually all marijuana enforcement in the US has been at the state level. Drug enforcement in the US hasn’t exactly been a raging success. In 2004, estimates were that sales of marijuana topped $10.5 billion. By 2010, the estimate had risen to $41 billion. Some 23 states, plus the District of Columbia, permit the use of medical marijuana. In recent years, Colorado and a handful of other states have gone even further. In his brief to the high court, Solicitor General Yarger said that Colorado’s approach to marijuana hinged substantially on signals from the Obama administration that it would not enforce marijuana laws in states seeking to decriminalize the drug. “The landscape changed radically when the current presidential administration began implementing an express policy of marijuana non-enforcement,” Yarger said. In 2009, a Justice Department memo said that although marijuana remains an illegal drug under the CSA, federal investigative and prosecutorial resources should not be directed toward individuals seeking medical use of marijuana in states that have legalized such use. The effect in Colorado was significant. Before the Justice Department memo, just over 5,000 medical marijuana patients were listed in the state. A year after the memo, there were 116,000 medical marijuana patients listed. Under the 2012 voter initiative, anyone over 21 is authorized to possess, cultivate, and use specified amounts of marijuana. The measure also authorized the state to license and tax retail marijuana businesses. In response, Attorney General Holder announced that the federal government would not challenge Colorado’s new law, or a similar measure in Washington State. More recently, Congress in December endorsed a policy of nonenforcement when it enacted a measure that barred the use of federal funds for any enforcement effort aimed at preventing states from offering medical marijuana. 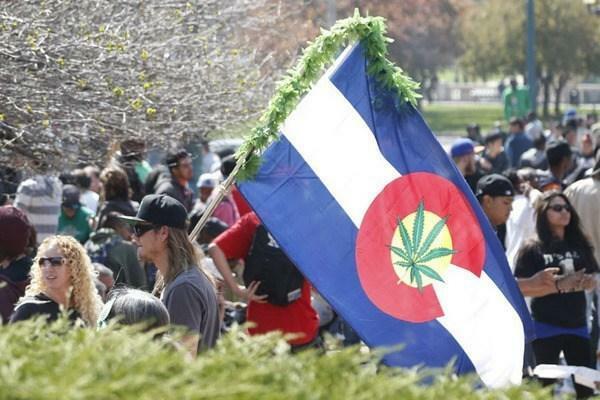 Colorado says it is entitled to pursue its own marijuana regulations. “Plaintiff states’ quarrel is not with Colorado but with the federal government’s relaxed view of federal enforcement obligations under the CSA,” Yarger said. He noted that Nebraska and Oklahoma were among the group of states that sued the administration over the president’s executive action on immigration. Nebraska and Oklahoma make similar charges in the context of marijuana enforcement. Colorado says that dispute is not relevant to its own decisions about how best to regulate marijuana within its own borders. “A state does not invade the sovereign rights of another state, by making a policy decision that parts ways with its neighbors,” Yarger wrote. Yarger noted that it is a violation of both federal and Colorado law to transport Colorado marijuana to a different state. “It is Colorado’s sovereignty that is at stake here: Nebraska and Oklahoma filed this case in an attempt to reach across their borders and selectively invalidate state laws with which they disagree,” he said. The states aren’t alone in their arguments. Colorado’s side drew support from the attorneys general of Washington State and Oregon. “This court has never used its original jurisdiction to resolve such policy disagreements between states, and it should not start now,” wrote Noah Purcell, solicitor general in Washington. “States can serve as effective laboratories of democracy only if they take differing approaches to problems,” he said. Changes in marijuana laws are happening in concert with legislative and executive decisions in the federal government. “It is both foreseeable and desirable that states will continue to exercise their sovereign prerogatives by adjusting their laws in fidelity to the beliefs of their citizens,” Mr. Purcell said.